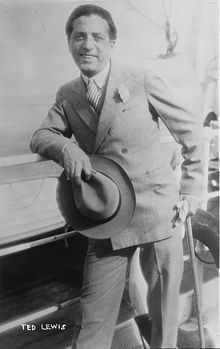 Theodore Leopold Friedman (June 6, 1890 – August 25, 1971), known as Ted Lewis, was an American entertainer, bandleader, singer, and musician. He fronted a band and touring stage show that presented a combination of jazz, comedy, and nostalgia that was a hit with the American public before and after World War II. He was known by the moniker "Mr. Entertainment" or Ted "Is Everybody Happy?" Lewis. Lewis died of lung failure in August 1971. Born in Circleville, Ohio, Lewis was one of the first Northern musicians to start imitating the New Orleans jazz musicians who came up to New York in the teens. He first recorded in 1917 with Earl Fuller's Jazz Band, who were attempting to copy the sound of the city's newest sensation, the Original Dixieland Jass Band. At the time, Lewis did not seem to be able to do much on the clarinet other than trill. (Promoting one recording the Victor catalog stated: "The sounds as of a dog in his dying anguish are from Ted Lewis' clarinet".) He improved a bit later, forming his style from the influences of the first New Orleans clarinetists to reside in New York, Larry Shields, Alcide Nunez, and Achille Baquet. By 1919, Lewis was leading his own band, and had a recording contract with Columbia Records, which marketed him as their answer to the Original Dixieland Jass Band who recorded for Victor records. For a time (as they did with Paul Whiteman) Columbia gave him a special record label featuring his picture. At the start of the 1920s, he was considered by many people without previous knowledge of jazz (that is to say, most of America) to be one of the leading lights of hot jazz. Lewis's clarinet playing barely evolved beyond his style of 1919 which in later years would sound increasingly corny, but Lewis certainly knew what good clarinet playing sounded like, for he hired musicians like Benny Goodman, Jimmy Dorsey, Frank Teschemacher, and Don Murray to play clarinet in his band. Lewis actually could play normally well without missed notes, as exemplified by his earliest records. For years, his band also included jazz greats Muggsy Spanier on trumpet and George Brunies on trombone. Ted Lewis' band was second only to the Paul Whiteman band in popularity during the 1920s, and arguably played more real jazz with less pretension than Whiteman, especially in his recordings of the late 1920s. Lewis recorded for Columbia from 1919–1933. He was on Decca 1934 into the 1940s. In 1932, Lewis recorded "In a Shanty in Old Shanty Town", which he had performed in the film "The Crooner" with his orchestra. It was released on a 78 and reached number one on the charts where it stayed for 10 weeks. Ted Lewis and His Orchestra were one of the featured entertainers at the 1939 Golden Gate International Exposition - Pageant of the Pacific on Treasure Island. The Sunday, August 13, 1939 Program of Special Attractions and Events indicates that the Ted Lewis Orchestra performed from 2:45 to 3:45 p.m. and from 5:00 to 6:00 p.m. in the Temple Compound and from 8:30 to 11:30 p.m. in the Treasure Island Music Hall for a free dance. Lewis' band became cornier and schmaltzier as the Great Depression wore on, but this seemed to match the general public's taste, as he remained commercially successful during an era when many bands broke up. Through it all he retained his famous catchphrase "Is everybody happy? ", along with "yessir!". Lewis adopted a battered top hat for sentimental, hard-luck tunes (he called himself "the high-hatted tragedian of song"). Frequently he would stray from song lyrics, improvising chatter around them. This gave the effect of Lewis "speaking" the song spontaneously: "When ma' baby... when ma' baby smiles at me... gee, what a wonderful, wonderful light that comes to her eyes... look at that light, folks..."
Lewis and his band appeared in a few early-talkie movie musicals in 1929, notably the Warner Brothers revue The Show of Shows. The first of several films titled with Lewis' catchphrase, Is Everybody Happy? also premiered in 1929, while 1935 saw Lewis and his band performing several numbers in the film Here Comes the Band. In 1941 the band was recruited at the last minute, along with the Andrews Sisters, to furnish musical numbers for the Abbott and Costello comedy Hold That Ghost (1941), released by Universal Studios on August 6, 1941. Musical numbers cut from the feature were released by Universal separately on September 3, 1941, in a short subject entitled Is Everybody Happy? In 1943 Columbia Pictures mounted a feature-length biographical film of Lewis—yet again titled Is Everybody Happy?—with actor Michael Duane portraying the bandleader and lip synching to Lewis's recordings. There is an extended caricature of Lewis in the Warner Brothers short Speaking of the Weather (Tashlin, 1937), playing Plenty of Money and You. Lewis kept his band together through the 1950s, and continued to make appearances on television and in Las Vegas into the 1960s. True to his vaudeville beginnings, he created a visual as well as a musical act. His physical presence with props like his top hat combined with bits of visual humor and dancing were as important to him as his music. One of his most memorable songs was "Me and My Shadow" with which he frequently closed his act. Around 1928, Lewis noticed an usher named Eddie Chester mimicking his movements during his act. He hired Chester to follow him on stage as his shadow during "Me and My Shadow". Eddie was followed by four other African-American shadows, the most famous being Charles "Snowball" Whittier, making Ted one of the first prominent white entertainers to showcase African-American performers. He died in New York City in 1971. In June 1977, Adah Becker Lewis and friends dedicated the Ted Lewis Museum and park in his honor in his home town of Circleville, Ohio. On July 15, 1956, he appeared as the mystery guest on What's My Line?. Lewis married Adah Becker (1897 – May 31, 1981) in 1915. She was a ballerina when Ted met her that same year in Rochester New York. Only six weeks later they were married in three separate ceremonies on the same day, first by a justice of the peace, next by a rabbi and finally on stage that night. They remained married for 56 years until the death of Ted. Adah gave up her dancing career to become his secretary, business manager and loving wife throughout her husband's long career. Once married, Ted and Adah lived in a 15-room apartment overlooking New York City's Central Park for the remainder of their lives. Ted Lewis died in his sleep on August 25, 1971, at the age of 81. Following a Jewish funeral service in New York City, his body was brought to his beloved Circleville where thousands walked past his coffin. Rabbi Jerome D. Folkman who officiated remarked, "The song has ended, but the memory lingers on." The burial was held at the local Forest Cemetery. Ted's stone, in the family plot, has his hat and cane incised upon it. Ted's beloved wife Adah, who died on May 31, 1981, rests beside him. Upon Ted's death, the City of New York, Yale and Harvard Universities and the Smithsonian Institution asked Adah for his memorabilia. She politely declined, saying Ted wanted everything to come back to the "Capital of the World," Circleville, Ohio. The Ted Lewis Museum, located across the street from where he was born, was dedicated on June 5, 1977. Adah, who had dreamed of a museum in the hometown that Ted loved so much, was present for the museum's opening ceremonies. Large numbers of celebrities, relatives, friends and Ted Lewis admirers from everywhere attended the dedication. The Ted Lewis Theater within the museum provides an opportunity for visitors to see Ted Lewis in performance by means of early TV and movie clips. Ted Lewis Park in Circleville, Ohio. Ted Lewis Museum at 133 West Main Street in Circleville, Ohio. Ted Lewis headstone at Forest Cemetery in Circleville, Ohio. ^ Tim Gracyk, "Earl Fuller's Famous Jazz Band", Popular American Recording Pioneers 1895-1925, via Red Hot Jazz.com. ^ 1939 Golden Gate International Exposition Program of Special attractions and Events for Sunday, August 13, 1939. Wikimedia Commons has media related to Ted Lewis.